The major portion of the area between the Bububu and Mphongolo Rivers consists of this landscape. A sub-section of this landscape also occurs further south towards the western boundary of the KNP in the vicinity of Timatoro. It extends northwards up to the Waterberg Sandstone. The underlying geological formations are undifferentiated metamorphic rock and amphibolite from the Swaziland System, as well as granite and gneiss. The terrain is mush less dissected than the adjacent granite and small pans are common. The following pans are the most well known: Nyamnyulu, Mahlambandlopfu and Sollie-se-Pan. The landscape is drained by the Shingwedzi, Bububu, Phungwane and Mpongolo Rivers and three warm springs viz. Malahlapanga, Mafayeni, and Matiovila occur. The absence of prominent koppies are characteristic of the area and the altitude varies between 400 and 460 metres above sea level. 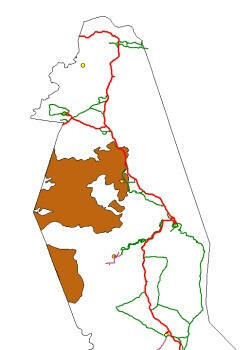 The landscape occupies 1042 km/2 or 5.5 percent of the KNP. Rainfall in the vicinity varies between 500 and 600 mm per year, with Shangoni with an annual average of 572 mm as the centre point of this landscape. Temperatures are mild and frost seldom occurs. It can be concluded that the temperatures will correspond with or be even milder than that of Shingwedzi as provided in Table 6. Due to the relatively flat topography there is very little variation in soil types. The soil, usually red to reddish brown in colour, is deeper than the soils found on granite. Dominant soil Forms are Hutton, Swartland, Glenrosa and Shortlands and the clay content of the soils is 15 percent and more. Close to the Bububu, Phungwane and Mpongolo Rivers, brackish floodplains occur which can be classified as Valsrivier and Sterkspruit soils. On the dykes of the rivers Oakleaf soils can be expected. The vegetation of this landscape is an open tree savanna with odd low shrubs (Fig. 29). The structural analysis is shown in the table below. The grass cover is dense (90%) with an average height of 1 metre. Dominant trees in the landscape are: Colophospermum mopane, Acacia nigrescens, Combretum hereroense and Acacia gerrardii. The shrub layer consists of the following species: Euclea divinorum, Albizia harveyi, Dalbergia melanoxylon, Cissus cornifolia, Neorautanenia amboensis, Maytenus heterophylla, Rhus spinescens, Combretum apiculatum and Tephrosia sericea, Combretum collinum subsp suluense is also present in this landscape but always at low densities. The field layer is dense and is dominated by Themeda triandra, Bothriochloa radicans, Digitaria eriantha var. pentzii and Panicum maximum. Other species which may occur are Pogonarthria squarrossa, Urochloa mosambicensis, Eragrostis rigidior, Cymbopogon plurinodis, Aristida congesta subsp. Barbicollis, Heteropogon contortus, Eragrostis superba, Urochloa brachyuran, Brachiaria nigropedata and Setaria holstii. Herbaceous plants are Clerodendron ternatum, Cassia mimosoides, Indigofera schimperi, Evolvulus alsinoides, Ruellia patula, Mariscus rehmannianus and Corchorus asplenifolius. On the brack soils along the spruits the grass cover is usually much sparser and species such as Chloris virgata, Sporobolus nitens and Urochloa mosambicensis occur. Woody species such as Colophospermum mopane, Spirostachys africana, Diospyros mespiliformis and Euclea divinorum are present. This landscape is preferred habitat for a variety of game. Depending on whether the veld has been burnt, large numbers of zebra, buffalo, eland, elephant, ostriches (Struthio camelus), tsessebe and warthog are present. Sable and roan antelope, kudu and even white rhino occur in this veld when the grass increases in height. Impala are restricted to the areas close to the rivers.